The Nile Tilapia or Oreochromis niloticus is just one of the over 100 different species that are called Tilapia. These fish have a rich history and were even caught by the Ancient Egyptians. This fish was first mention in literature by Aristotle in 300 B. C. and was allegedly given to Jesus during the Sermon on the Mount. 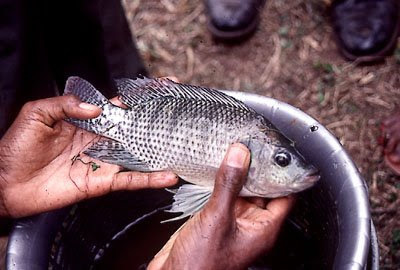 Tilapia are still an important fish for many people in Africa and many other parts of the world. It's not just Africa though, the Nile Tilapia is the most widely domesticated Tilapia in the entire world! Also known as St. Peter’s Fish, and for some strange reason the Aquatic Chicken the Nile Tilapia have thin bodies and vertical stripes much like the Perch. These fish are normally greyish green, but they have developed reddish versions of this species as well. They can reach almost 2' in total length and weigh about 9lbs maximum. The Nile Tilapia is one of the fastest growing fish in the world. These amazing fish can grow up to 3 pounds in its first year! This combined with their ability to withstand bad water quality makes them perfect for fish farms. Nile Tilapia fish are omnivores that feed on underwater plants and algae. For this reason they are also used to control aquatic weeds. Research in Africa has shown that these fish feed on mosquito larvae as well, which can be a huge help in fighting disease. Yet another big bonus for having these fish around!